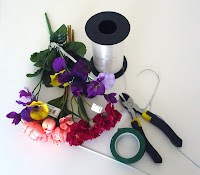 c) wrap the stems with green electrical tape which is much stronger than floral tape. I'm fairly happy with the final crown, which will hopefully survive life in the dress-up-box for longer than a few wearings. And having 2 daughters leads me to believe that fairy parties are not a thing of my past and I'll get to use my new-found knowledge in the near future. what a great gift idea. I bet the kidlings really enjoyed working on it. It is beautiful! I bet the birthday girl was thrilled.